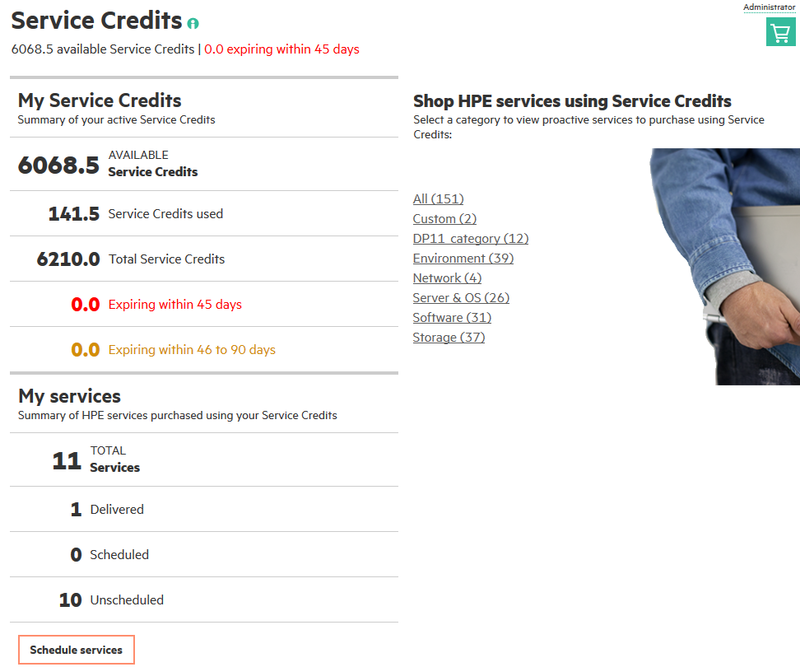 Service Credits purchased on HPE support agreements. The HPE services exchanged for those credits. Additional HPE services available for exchange of Service Credits. For authorized users, the ability to purchase HPE services using a shopping cart. To access Service Credits, you must have a proactive services support agreement associated with your HPE Passport profile. To reach Service Credits, browse to the My IT Environment homepage, either from the main menu or the HPE Support Center homepage. On the My IT Environment page, click My IT Environment > Service Credits. You can print the displayed results from any page. 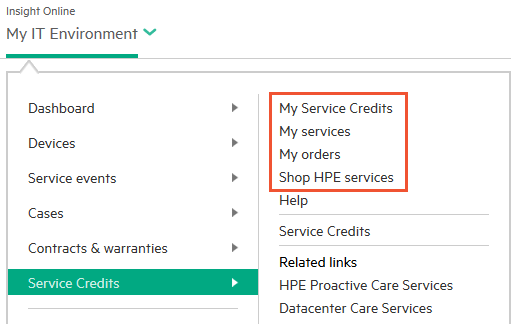 Administrators will see a shopping cart in the upper right of the Service Credits pages, and can use Shop HPE services to purchase more services by adding them to the cart. Members can view My Service Credits and My services, and access featured HPE services. Administrator and member roles exist in the context of a contract and warranty share. To access Service Credits, the contract and warranty share must contain at least one service support agreement, and include a user group that includes you as a member, with the administrator or member role enabled for Service Credits. This is the same mechanism used for granting access to other features of the HPE Support Center. See Assign roles to user groups for more information. This page displays Service Credits against all your active and expired support agreements. These agreements are either linked to your HPE Passport ID directly, or through a device group or contract and warranty share that was shared with you by another user who enabled the Service Credits role. Support agreements that expired within the past two years are included. The displayed list shows Service Credits by Support agreement, which can include a Service Agreement ID (SAID) or a Support Account Reference (SAR). If you have no currently active Service Credits, you can use the View filter to see expired or all Service Credits instead. You can filter by status or search using the drop-down and search box at the top. Click an SAID or SAR to go to a page showing the details of the specific agreement in the Contracts & Warranties area. Click an individual Service Credit item to see details. Sort the results by any column by clicking on the column head. 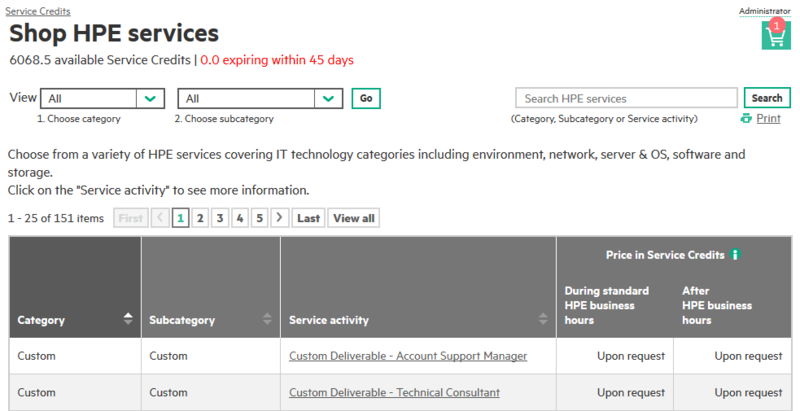 The My services page displays HPE services purchased using Service Credits from active and expired support agreements. These agreements are either linked to your HPE Passport ID or shared with you by another user. Support agreements that expired within the past two years are included. By default, the list is sorted by status. Filter the results by status using the View drop-down list. Sort the results by any column by clicking on the column head. Click a service activity name in the list to go to the service overview page in Shop HPE services. Click View details to show the detailed status for the service activity. On the My service details page, click on the contextual help icon next to the service name to see a brief description of the service. E-mail HPE. Use this form to request that an HPE services representative contact you to discuss your business needs. The representative will contact you within three business days of submitting the request. Provide details and contact information in the form. Schedule service. Schedule and unschedule services in the list using the Actions drop-down list at the far right. After you make the change, the status and dates for that service will be updated in the list. Reschedule service. Change the date of the service. When rescheduling, HPE will review the request within three business days and either confirm or will email you proposing an alternate date and time. Remove scheduled date. Revert a service to the unscheduled status. Cancel service. If you cancel a service, the Service Credits associated with that service are refunded to the support agreement that has the furthest expiration date, up to what it contributed to the original order. Cancellation information is appended to the original order in My orders. Service Credits cannot be refunded to a support agreement where those Service Credits have since expired. Note you cannot cancel a service credit if the credit has been used or is expired. The My orders page displays your orders purchased using Service Credits. The list displays the service activity within the order, as well as other details. You can filter the list, sort it by column head, and search for orders. Use the Actions drop-down list on the far right of each row to view details. If you are an administrator, the list includes a link to reorder services. Click an order in the list to see order details. You can choose a variety of HPE services from the list. Filter the list using the category and subcategory drop-down lists, and sort the results by category, subcategory and service activity. You can also search for HPE services using the search text box. Click a service activity in the list to see an overview. This displays a price, in Service Credits, for the service, and boxes for you to enter the quantity of the service, to add to your cart. Some activities have prerequisites. If so, click the Prerequisites tab, and purchase them in the same way. If you have support agreements spanning more than one country you will be asked, only once, to specify the country for the HPE service. Select the country from the drop-down list. The cart may indicate that you need to make changes to your services. If so make the necessary changes then proceed. Before submitting your order you can review the order and specify which Service Credits you want to use. By default the checkout process assigns Service Credits to pay for cart contents by expiration date, with those scheduled to expire first being used first. You can change this before submitting the order, by using the Service Credits to use field in the right column. Review the information, check the box indicating you have understood and accepted the scope of the services as described, and submit. When checkout completes successfully, an order number is displayed, and confirmation is emailed to you. View the current contents of the cart at any time by clicking the cart. You can request a custom service activity. Provide details of your request, your contact information, the support agreement containing the Service Credits you wish to use, and submit the form. An HPE representative will contact you within three business days. You can also provide feedback using the feedback form.